The Medical Corps is a military unit providing medical services too all army personnel, in war and peace. 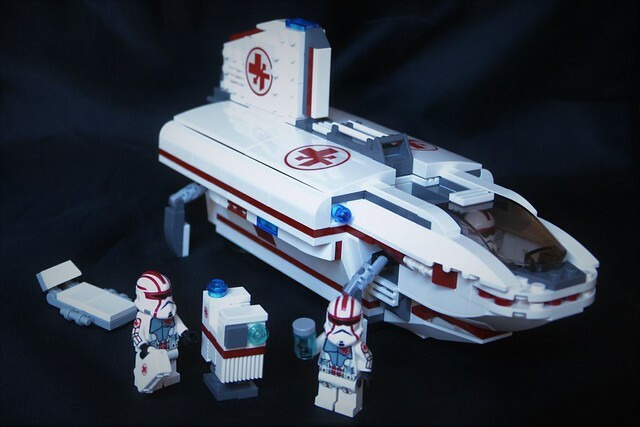 The Medical corps services were formed during the Clone Wars and incorporated to the Grand Army of the Republic. The decision to create such unit was taken by the Senate of the Republic as the war started to prolongate and to expand onto a growing number of planets through the Galaxy. A majority of senators acted that then that it would be less expensive and faster to attempt “fixing battle-damaged clones” than growing more. 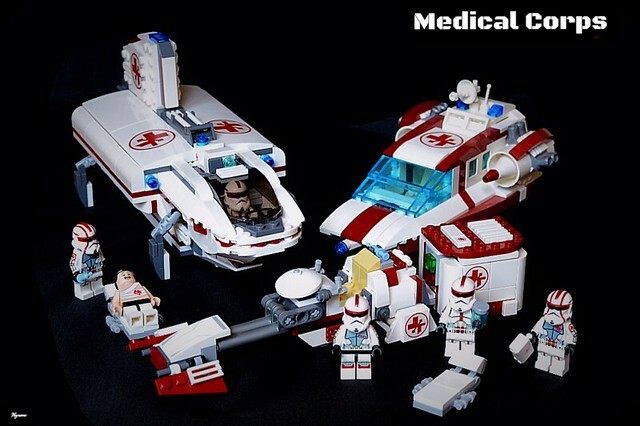 However, and still for budgetary reasons, the future Medical Corps would be granted only second-grade equipment: modified outdated ships and speeders, old droids and equipment… Still, the Medical Corps was voted in and assigned with the task of identifying, evacuating, healing clones wounded on the various battlefields before sending them back to active duty. 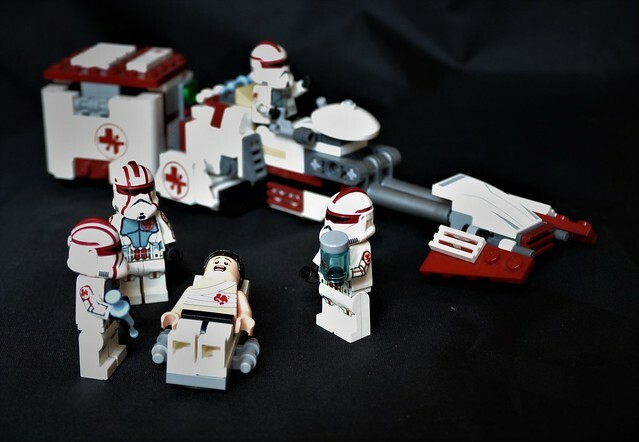 With the rise of the Empire, the Medical Corps was simply renamed into Imperial Medical Corps. Equipment were barely upgraded on a strict necessity basis and the overall budget did not really increase. Classified documents from the Commission for the Preservation of the New Order (COMPNOR) later revealed that showing wounded troops and casualties had to be considered as negative propaganda that could only serve any rebellion movement. Therefore appearance, size, and image of the medical care activities should keep a low-visibility profile. Medical Corps members were first clones and as such had standard clone armors retrieved from the Grand Army surplus. Only a specific medical marking pattern based on dark red was applied to distinguish them from regular combat units. Because of the budget restrictions, not all armors were similar across the unit. HowTo: Helmets are from Clone Army customs. All minifig torsos, arms, legs and accessories have custom decals (water transfer). The LAVr QH-6 chariot is a multi-functional speeder universally exploited by various ground forces as a light transport vehicle. The Medilance variant has been adapted to medical care and can carry one stretcher. 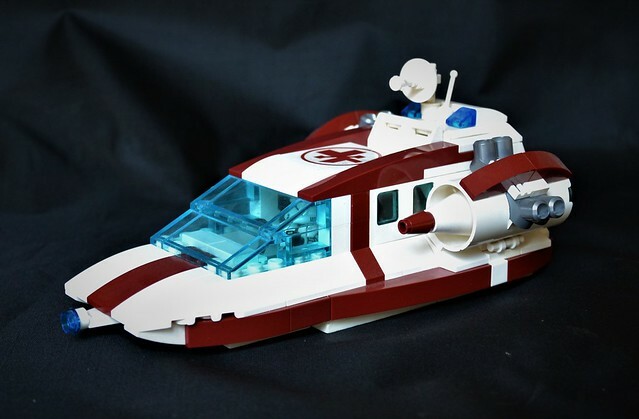 HowTo: MOC with custom decals inspired by the old LL-924 design. The root can be opened to add or remove the pilot. 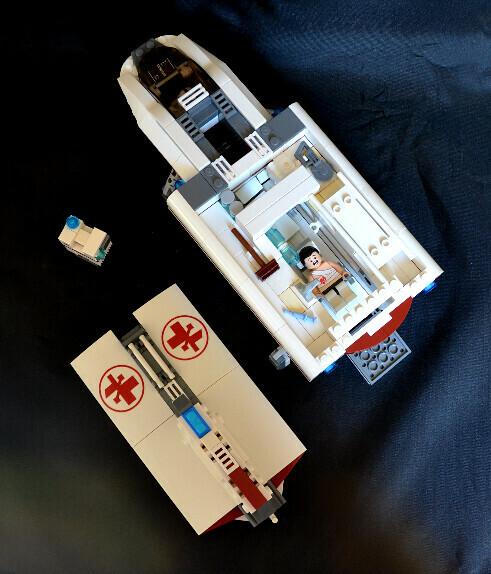 Several accessories can be moved inside to simulate medical activities. The stretcher easily slide in and out. 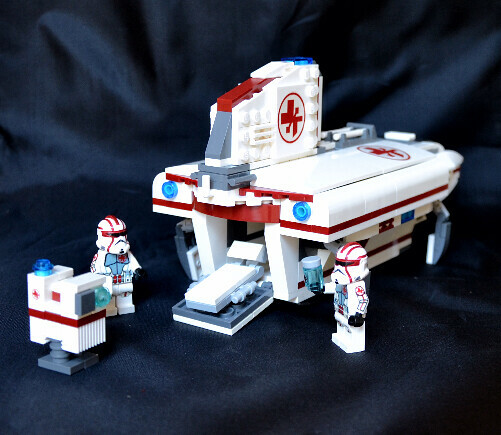 Several old separatist Sheathipede shuttles were retrofitted into medivac shuttles. These could carry up to two wounded troopers on stretchers, a droid (often a EG-6 Power droid to power medical devices), and the pilot. HowTo: MOD based on the 75170 Phantom set. 8 studs longer, with custom decals (water transfer), additional details and greeble, detailed interior and place for a custom power droid. All vehicles have playable features (opening compartments, rotating devices…). They are all highly swooshable and quite sturdy. So, what is your favourite element of this Medical Corps ? I’m now considering building a capital ship for the Medical Corps. Maybe a Pelta-class or something more exotic. Ideas welcome …. Size matters not. Comments, remarks and constructive criticisms are most welcome. That's a clever idea and well executed. I love mocs with play features and that specialized Gonk is perfect. I hope you do build a cap ship to go with them. 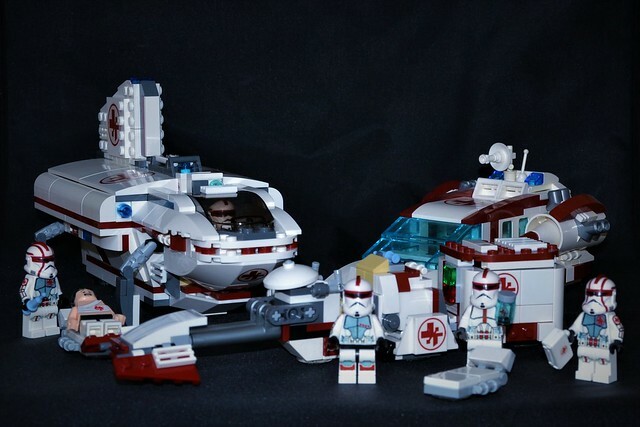 My only critique is the speeder bike seems oversized next to the other vehicles, but that seems like a common enough theme in Lego speeder bikes. Solo wrote: That's a clever idea and well executed. I love mocs with play features and that specialized Gonk is perfect. I hope you do build a cap ship to go with them. 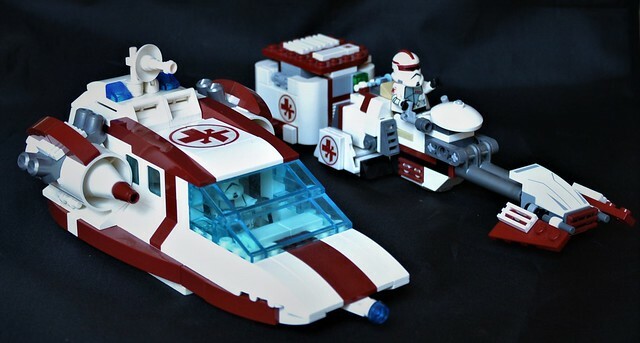 My only critique is the speeder bike seems oversized next to the other vehicles, but that seems like a common enough theme in Lego speeder bikes. Yes, the speeder is heavy but at the same time, it has probably the right scale to tractor several creates of supplies. 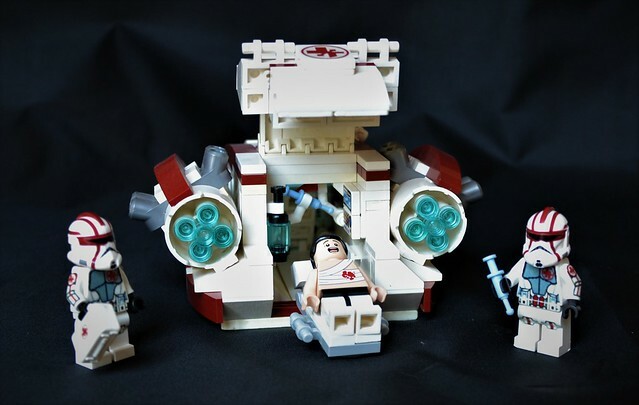 Cool; star wars + medical = cool.